Using earth-friendly cleaners is a great way to keep harmful toxins out of your home. The environment also benefits from the reduction of chemicals dumped daily into water systems and polluting the air. 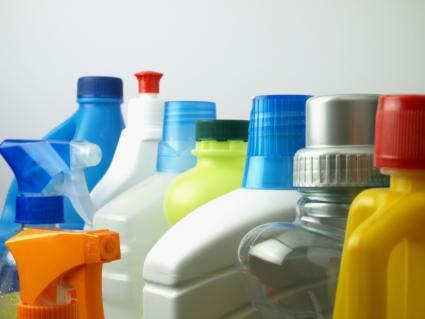 Children and pets are especially susceptible to the damage caused by toxic chemicals in most everyday cleaning products. Alternative toxin-free products are easy to find with comparable cleaning results. There are more green cleaning materials available today than a decade ago. Earth-friendly consciousness prompts people to eliminate chemicals in their homes. All natural cleaning products aren't always harmless. Some brands have excellent reputations as earth-friendly and safe for human use. Learn what's in products by reading labels and educating yourself about possible chemicals contaminating your home. Safe plant-based products are available from the company that was founded in 1989. 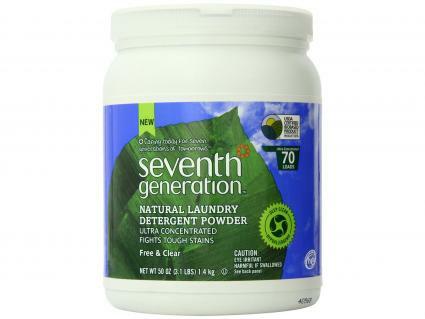 Seventh Generation is one of the biggest and oldest manufacturers of earth-friendly cleaning products. Their "Free & Clear" products contain no dyes or fragrances. Botanical Disinfectants: CleanWell™ Patented Disinfecting Technology includes wipes, bathroom cleaner and multi-surface cleaner with lemongrass citrus. It kills 99.99% of household germs and is effective against viruses, such as the common cold, Influenza A and H1N1. Natural Laundry Detergent: This "USDA Certified Biobased 97%" is made for sensitive skin. It "removes 100% of visible tomato sauce and strawberry stains". Doesn't contain any synthetic fragrances or dyes. Use in both standard and HE washing machines. In addition to cleaners, Seventh Generation manufactures feminine care products, baby diapers and wipes, paper towels and toilet paper. The company offers coupons, special offers, surveys and test product offers when you sign-up on the website. The more active you are in the website community, the more offers and points you earn. You can find a store locator or purchase through an online store like Amazon. ECOS Hypoallergnic Laundry Detergent, Magnolia and Lily: This plant-derived detergent is advertised as one of the company's bestsellers. ECOS Dishmate Hypoallergenic Dish Soap, Almond: Touted as one most popular choice, this product is also plant-derived, only requiring a few drops on a sponge to "clean an entire sinkful of dishes!" More products are offered, such as air fresheners, veggie wash, paper towel, toilet paper and pet essentials, such as shampoo, wipes, no chew trainig aid and pet laundry. Use the store locator to find a retailer near you or you may prefer to order online directly from ECOS. Greenshield Organic® is a division of Greenology Products, Inc. created by "a dad on a mission to protect families from the harmful chemicals found in most cleaning products." These organic cleaners are USDA Certified Organic laundry detergents, spray and specialty cleaners manufactured in the USA. The products are independently tested and no testing is done on animals. Parent company Greenology's "safe, oil removing" cleaners were used on the sea animals, birds and other wildlife during the 1989 Exxon Valdes oil spill. From this jumping off point, the company expanded to include it's current Greenshield brand. Greenshield Organic Toilet Bowl Cleaner: This is a highly rated safe product by the organization Environmental Working Group (EWG) that is non-toxic, hypoallergenic, non-volatile. Greenshield Organic Carpet Spot Cleaner: This cleaner removes stains, such as wine, coffee, cola and pet stains. It has a "fresh scent of Orange Blossom". You can shop online or find a local store near you through the company website. The Biokleen products include laundry liquid or powder, dishwasher powder, dish liquid and a soy cream cleaner as well as a stain/odor remover. According to the website, the company, it uses "third-party audit and the Personal Care Council guidelines for full ingredient disclosure". 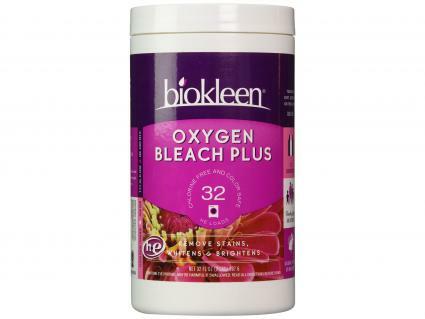 Biokleen Oxygen Bleach Plus: The active ingredient is made from sodium percarbonate, aka hydrogen peroxide in a natural form. The company states that it considers hydrogen peroxide to be a safer choice than chlorine bleach. It is color-safe and can also be used to remove carpet stains. Biokleen Ammonia Free Glass Cleaner: The product ingredients contain "vinegar and plant-based surfactants" with no artifical colors or fragrances. The website states that it is "Preferred by professional window washers." Mary Findley, author of The Complete Idiot's Guide to Green Cleaning, says "One of my favorite companies is Biokleen. They are dedicated to both the health of their customers and that of Mother Earth. I use their liquid dish soap and laundry detergent and have for years. " You can either purchase their products online and find a store near you. One well-known soap cleaner is Dr. Bronner's. This fabled 18-uses vegetable oil-based soap comes from an Old World Jewish soap-making tradition. The Bronner family has been making soaps since 1858. Emanuel Bronner became a certified master soapmaker and open for business in 1948. Known as a workshorse all-purpose cleanser, the value of a single bottle of the liquid soap is that it only takes a little bit, diluted with water. The website offers a cheat sheet with diluting instructions. All U.S. and Canadian products are "Certified Vegan" with two exceptions, Organic Lip Balms and Organic Body Balms. These products contain organic beeswax. All of the products are also cruelty free, meaning no animal testing. You can purchase these directly from the Dr. Bonner's website or use the website store locator. 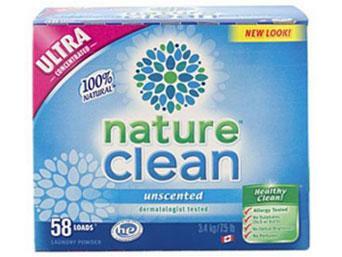 Nature Clean products are "non-toxic and biodegradable and created from naturally derived ingredients." This Canadian company states that it follows US and the European Union groups' strict guidelines when they select product ingredients. The company states its goal is avoiding the use of "any possible suspected carcinogens (cancer causing chemicals)." After in-house testing, the products are tested by independent labs. Laundry Liquid: This is hypoallergenic. Doesn't contain synthetic optical brightener chemicals, chlorine bleach, enzymes, synthetic dyes or perfumes phosphates or EDTA & NTA (phosphate replacements are environmentally hazardous). Laundry liquid or powder, stain remover and fabric softener. Dish liquid, powder, pacs and gels. Household cleaning, including kitchen, bath and general. The website features a store locator for Canada. For U.S. buyers, Amazon carries most of Nature Clean products, although there is a shipping charge, so be sure to check out the shipping fee before checking out. Ensure the product you're choosing is earth-friendly by utilizing watchdog groups like the Environmental Working Group (EWG). The EWG is a well-known and highly respected watchdog group that also evaluates cleaning products as well as foodstuffs. It is a go-to resource prior to purchasing a new product or to double-check current products against their ratings section. In addition to product ratings, the EWG also features a Label Decoder to help decipher label terminology. Many "green" or "earth-friendly" manufacturers often have different versions of the same product. Companies are always changing their products for different reasons, such as regulatory, environmental and other legitimate reasons. According to Mary Findley, this makes reading labels imperative, even for products you've used for years. Mary says, "First of all manufacturers are not required to list the chemicals in a product on the label of a bottle." This can make it difficult to know what you're actually using in your home. A classic example of this type of discreancy can be seen in EWG ratings for the same product is that of the Biokleen Ammonia Free Glass Cleaner. One tested in 2011 was rated D while the 2015 version rated A. Some people mistakenly believe that earth-friendly and organic or healthy products are the same. They aren't. Earth-friendly products can sometimes contain ingredients that may have health concerns related to its use. Some companies take advantage of this. Mary explains, "To make matters worse they can use words like 'eco-friendly', 'safe for the environment' or a host of other 'green' sounding words when in fact, the contents contain toxic elements." There's only one way to protect yourself against such deceptive advertising. Follow Mary's advice, "Unless there is an EPA or Green Seal of Approval or other nationally accredited certification on the bottle there is no way to know if the product is safe." Lemon juice, vinegar and baking soda all make effective household cleaners at a fraction of the price of commercially available products. It's not difficult to make environmentally friendly cleaning products yourself. You can also make your own glass cleaner, mildew remover and grout cleaner and more. With so many toxins in the environment today, it's up to individuals to become expert earth stewards. This requires taking the time to understand what the ingredients are in cleaning products and if they are harmful to the environment or humans. Some products may have trade-offs while others may be 100% ideal ecologically and safe for humans.